I've spent the last couple of weeks tinkering with GJK and ended up rewriting it from scratch. Ever since I saw Casey's video about SAT-GJK a couple of years ago I've wanted to try it, so I finally did. Now Casey's video only deals with binary overlap status, not closest points, but it was relatively easily to extend his approach and even do a linear sweep operation. I especially like how his method does not include any divisions or square roots, which makes it very robust. I must add though that it's not straightforward to get a robust implementation that works on both polyhedra and quadric objects. Especially the termination criteria needed a lot of attention. 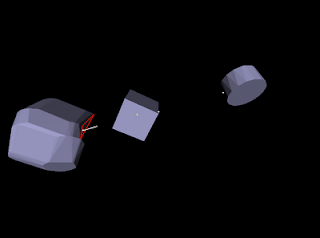 On the left is the configuration space object, the red triangle is current simplex, with closest point and normal. The corresponding object space closest points are also visualized on the two objects. I could have spent even more time on visualization, and I might just do that, because next I want to try out a couple of ideas for penetration depth computation. The new implementation is both more robust and higher performance that the old one from Meqon one, which uses Johnson's distance algorithm from the original paper. I'm not sure how it compares to the Bullet implementation with geometric distance algorithm. Part of the performance increase is due to a more efficient caching scheme. To old version only supported an initial 1-simplex, which was the previous frame's closest points, while the new uses the whole previous simplex, which is a bit more complicated, since it can deform badly due to motion, but it really pays off, and most of the times it will terminate immediately after the first iteration. So, depending on the scenario, and how much motion there is, the new version ranges from slightly faster to almost three times faster. More importantly though, is that the new version is more numerically robust. I find it quite fascinating how Casey's approach with caching is very similar to the old Lin-Canny closest feature algorithm. Both methods are based on voronoi regions, but Casey's operates in configuration space, while Lin-Canny uses object space. Casey's approach uses implicit voronoi regions determined by support functions, while Lin-Canny uses explicit pre-computed voronoi regions, but the underlying principle, that the closest distance is always found within the voronoi regions of a particular feature pair is the same. What currently keeps me awake at night is if there might be an implicit configuration space counterpart to V-Clip, which would then work for penetrating objects as well? The only implicit penetration depth method I'm aware of that has been proven to work is EPA, but it's so awkward I'm not even going to try implementing it. Intuitively I feel like there must be a simpler way to compute exact penetration depth that doesn't involve dynamic data structures.